This is a serious yacht built to Lloyds A-1 Specification by Offshore Yachts Ltd. Designed by Alan Buchaanan and solidly built for the stormy North Sea. She is well maintained and ready to sail. Above decks and mounted on the Mahogony Bowsprit is a 25 lb CQR and a 15 Lb Dansforth. 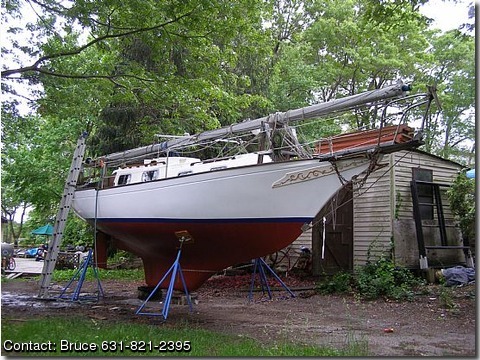 The 140 Genoa is in very good condition. Also included is a 180 Genoa for light air and a storm Jib that I have never used. Main Sail is in Good condition and fully battened Mizzen is very good. Below decks she could use new cushions. V-berth forward with 12v/110v Refrigerator beneith. Porcelain Head and Sink to Port hanging closet to Starboard. Next aft to Starboard is a stainless steel sink with pressure water and a 2 burner propane stove. To Port a lovely teak dining table that folds down into a double bed. Next aft is a quarter bearth to Starboard and another hanging closet to Port. There is plenty of teak trim on deck and below. The lovely classic lines draw a lot of compliments. She is a good sailor and the place to be in a storm. Ample storage and sleeps 5.